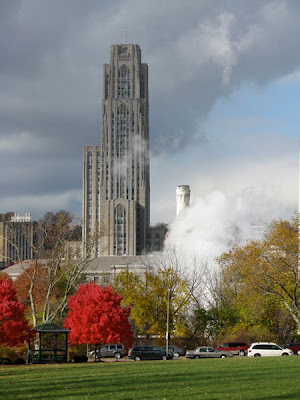 So, after the Phipps, we came out of the front door and there was the University of Pittsburgh, which the natives fondly refer to as "don" or "dawn" Pitt. "Dawn Pitt" means down at the University of Pittsburgh, or at the University of Pittsburgh--whichever works. The top image is of the Tower (Taur in yinser) of Learning--a building with wonderful classrooms decorated (with gobs of coinage) to reflect the different cultures that make up Pittsburgh. Then, our sights travelled across Schenley hill to Hammerschlag Hall at Carnegie Mellon (my alma mater). On the hill, there were a few engineering types from the Institute for Robotics at CMU with their robot project they were taking for a test drive. Almost as if it were a commercial for CMU, the driverless car (the back up) came down the street for all of us to ooh and ah over. Do you think the development people were up to something? It was all very exciting.